Over the course of my career, I have heard many people incorrectly refer to both observed water levels and topographic heights in terms of “mean sea level.” For example, take these two statements. “Hurricane Hugo produced a storm surge that was 20FT above mean sea level,” and “the first floor elevation of my house is at 35FT above mean sea level.” What is wrong with these two statements? They both mention a “datum,” which is a standard position or level that measurements are taken from, correct? Yes, they both mention “mean sea level,” so what is the problem? Well, the problem is the elevation data that was used to derive these numbers is referenced to what is called an “orthometric datum” and mean sea level is actually what is called a “tidal datum.” Here is where it gets confusing and requires a somewhat technical explanation, which is probably what you were looking for coming to a Tech Blog. An orthometric vertical datum is defined by the NOAA/NOS/National Geodetic Survey (NGS) Geodetic Glossary as a set of constants specifying the coordinate system used for geodetic control, that is, for calculating the coordinates of points on the Earth. In the U.S. the two most commonly used orthometric vertical datums today are the National Geodetic Vertical Datum of 1929 (NGVD 29) and the North American Vertical Datum of 1988 (NAVD 88). NGVD 29 (sometimes incorrectly referred to as Mean Sea Level) started out being named the Sea Level Datum of 1929 and was based on fixed Mean Sea Level at 26 tide gauges in the U.S. and Canada. It was defined by the observed heights of mean sea level at the 26 tide gauges in 1929 and by the set of elevations of all benchmarks resulting from the adjustment. This datum was not mean sea level, the geoid, or any other equipotential surface. Therefore, it was renamed in 1973 to NGVD 29. NAVD88 was established in 1991 by NGS to include many more benchmarks and leveling and to rectify changes in vertical elevation due to crustal motion, postglacial rebound, and subsidence. Distortions amounting to as much as 9 meters had been seen due to forcing the new leveling to fit the NGVD 29 height values. NAVD88 was affirmed as the official civilian vertical datum for the United States by a notice in the Federal Register (Vol. 58, No. 120, page 34325) on June 24, 1993, by the Federal Geodetic Control Subcommittee (FGCS), superseding NGVD 29. The notice stated any surveying or mapping activities performed or financed by the federal government be referenced to NAVD 88. In addition, it required that all federal agencies using or producing vertical height information undertake an orderly transition to NAVD 88. Today, most elevation data is derived from LIDAR data that, when collected, is referenced to the ellipsoid. This gives users the ability to transform to other datums (either tidal or orthometric). Most users of the data will transform it from the ellipsoid to NAVD88 before creating derivative products such as Digital Elevation Model (DEMs), which are used for modeling and mapping inundation. So the storm surge of 20FT and the first floor elevation of 35FT are both referenced to NAVD88 because both heights were probably surveyed from elevation data or benchmarks that were referenced to NAVD88. NOAA has a tool called VDATUM that can be used to transform elevation data such as LIDAR to and from tidal/orthometric datums via the ellipsoid. 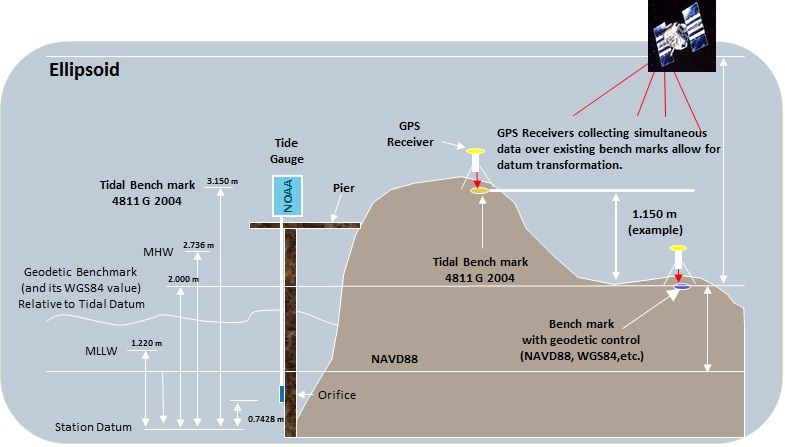 A tidal datum is defined as a vertical reference based on a specific stage of tide that serves as a baseline elevation to which sounding depths or topographic heights are referenced. NOAA maintains the National Tidal Datum Epoch (NTDE) to reflect changes in mean sea level along the nation’s coast. The NTDE is a specific 19-year period over which tide observations are taken to determine Mean Sea Level (MSL) and other tidal datums such as Mean Lower Low Water (MLLW) and Mean High Water (MHW). The 19-year period includes an 18.6 year astronomical cycle that accounts for all significant variations in the moon and sun that cause slowly varying changes in the range of tide. The NTDE was adopted so that the tidal datum determination throughout the U.S. is based on one specific common reference period. MSL, a tidal datum, should never be equated to NGVD 29. NOAA CO-OPS is responsible for managing the National Water Level Program (NWLP) for the nation and has adopted the National Tidal Datum Epoch (NTDE 1983–2001) as the official tidal datum reference period for all tidal datums (including MLLW, MHW, etc.). The 1983–2001 NTDE recently superseded the 1960–1978 NTDE. NOAA CO-OPS currently provides water-level information referenced to the Mean Lower Low Water (MLLW) tidal datum, based on tidal benchmarks at or near tide gauges. MLLW is defined as the average of the lower low water height of each tidal day observed over the National Tidal Datum Epoch. This is the tidal datum used on NOAA Nautical Charts for representation of depth soundings, and thus has been embraced and widely used by the navigation community for many years. Mean Sea Level is also a tidal datum defined as the arithmetic mean of hourly heights observed over the National Tidal Datum Epoch. Shorter series are specified in the name; e.g. monthly mean sea level and yearly mean sea level. In many locations mean sea level is close to NAVD88. For example in Charleston, SC the difference between NAVD88 and mean sea level is only 0.21FT. But in other places, like San Francisco, CA the difference is 3.18FT. So referring to heights that are based on elevation data referenced to NAVD88 (ex. 20FT storm surge and 35FT first flood elevation) as “mean sea level” is not technically correct. OK, so now that I know all of this and can call myself a datum geek, how should I change my terminology? Back to the two statements. Your friends won’t understand what you are talking about, but you can pride yourself in being correct. Previous U.S. National Lidar – is there a business case? Next ENOW PLUS: Go Fish! Engineers need to know these basic concepts, especially those who plan and design drainage system and flood control system that are affected by tide elevations or river stages. I am a real estate agent, preparing to offer developer lots for sale which are located inland from a Southeastern US (Lowcountry) coastal city. The plat for the subdivision notes a line cutting across several of the lots, citing “Approximate Flood Limits” serving as a frontier between a Zone X Flood classification and a Zone AE Classification, with an elevation of 14.5′ (NAVD). The local municipality requires the first horizontal floor to be no less than 15.5′ NAVD. Is this difference intended to raise the structure out of the AE classification and into the Zone X classification, even if portions of the lot remain with an AE classification? It sounds like the extra foot the local multiplicity requires above the Base Flood Elevation is a 1foot freeboard to account for either future flood risk or more extreme events. It is common for municipalities to go above and beyond the required BFE. Many communities get reduced insurance premiums for this because they get points in the FEMA Community Rating System. This is a great explanation that almost everyone can understand. It should be shared with other agencies who still, mistakenly reference things to MSL.